Hey peeps, it is me, Pauley James & I am here to tell you all about our spotlight pooch for the day! Shirley is one SWEEEEEEET doggie!!! I know, I know, the Mrs. always calls ALL dogs sweet, but not me! In order for me to call a poochie sweet, they really have to earn the title.The lowdown on girly Shirley is that she was abandoned in her former home along with 2 other adult dogs & 7 puppies!! !So finally someone found them & they ended up at the shelter & guess what?! Shirley was pregnant! That is where we came in, she got to come & stay with us the day that she had the pups. Shirley was at my house for 6 weeks, but we only got to interact for about a week. She was too busy with all of those zombie puppies!! During the time she was separated from us, there were only a few baby gates between us so I could still see what was going on & hear everything! I never heard her growl or bark. She was extremely quiet. Once she was able to interact with Ciera & I, she was still super quiet, but did surprise us by playing with us. So um what I am saying is that she is a SWEEET girl who is house/crate/zombie trained! Oh she also likes the kitties. I did overhear the Mr. & Mrs. talking & they said that if they did not foster & they did not already have a house full, she would be one that they would love to keep. She is easy peasy!!! 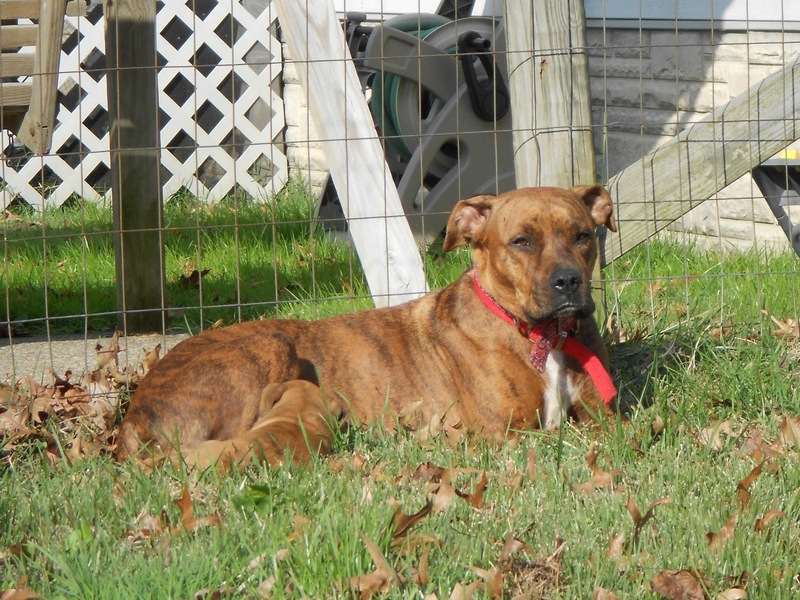 Shirley is located in Eastern KY, but transport IS available. If you or anyone you know may be interested in Shirley, please email weedlekitty@yahoo.com for more information. Be sure to check out all of the other animals in need at Mayzie's blog !!!!! She does seem so sweet! Shirley is beautiful! Hope she finds a home soon! Oh, Shirley! What a Most Wonderful girlie you are! I can tell just looking at your face what a sweet soul you have. AND I find it most impressive that you're able to handle zombies! That could come in very handy someday. I hope you gets your furever and ever and always home real soon! we love brindle puppers !!! I'm so excited for Shirley's happy ending. I hope her forever family finds her very soon!